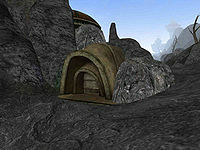 Shishi is a Velothi tower located northwest of Maar Gan that appears to be the stumbling block between Telvanni and Redoran. 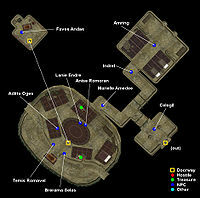 A House Redoran quest sends you here to kill the remaining rogue Telvanni in the tower and bring back the Shishi Report. The Telvanni counterpart quest sends you here to kill the Redoran intruders. After surveying the premises, you'll find dead Telvanni and Redoran warriors clad in bonemold armor, but the owner of the tower is more hidden. A careful search reveals Faves Andas in a secret room, accessed by turning a Breton Skull on a table on the upper floor. Peculiarly, if you belong to House Redoran and enter Shishi without having initiated the Shishi Report quest, Anise Romoran and the other Redoran soldiers may attack you. They can be killed with no penalty in this scenario. This may also happen if you are House Hlaalu or unaffiliated with any great house. Dunmer Warrior House Redoran Lawman(Lawman) 17 187 106 30 90 If you are Telvanni, kill him; if Redoran, obtain a report from him. Dunmer Sorcerer House Telvanni Lawman(Lawman) 17 126 176 30 90 If you are Telvanni, help him to kill Brerama Selas; if Redoran, kill or just leave him alone. Dunmer Warrior House Redoran Retainer(Retainer) 9 119 92 30 90 If you are from Redoran, he will tell you about remaining Telvanni agent. * Technically the dead bodies of the Telvanni occupants do not belong to the House.